Old houses can be beautiful. Our house was built in 1786. At least by American standards, it is very, very old. It's not good because it's old, it's old because it's good. This house has been very well cared for over the years by all of the owners before us. The most recent ones left us this silly sign, price tag still on the back, a passing of the torch. We have kept it, placed on the trim above the poorly placed laundry closet. Occasionally, it falls off, upset by the loud and rhythmic jouncing of the spin cycle of a washing machine that sits on the old hand hewn timbers which still have a bit of give to them. The thunk it makes, or the near miss to my head when I open the closet door, is a reminder of the work, the sometimes inconvenience, of living in an old home. With drafts and mice and wear and poorly placed things. Since we moved in, we have done a few improvements, such as replacing the leaking barn roof, but mostly we have lived in it, and added to its wear, its patina, more than anything. Added our own dings and dents and scratches and scuff marks. Moving here, we knew this home came with responsibilities, to preserve and maintain one of the oldest homes in Portland. Connecting people to our colonial roots and to help them discover, imagine and value the relevance of this history to our lives. For three years, we have lived here and noticed, besides its beauty, the things that do not work quite right. And mostly, we have made do. But now, familiar with its weaknesses, we hope to do a few small things this coming summer, to mend a few problems and update systems to make the house greener and more energy efficient. Perhaps it is because I noticed that our large silver maple has begun to bud, perhaps confused by a warm patch we had a bit ago. I got worried that this could be a problem for Sylvia. But Jonathan reminded me that likely, in Sylvia's 250 year old life, this has happened before. Like our house, she has seen this before, and will withstand it. Another early sign of a change in the light is that the chickens are beginning to lay more eggs. We are preparing for spring as well. Ordering our seeds and trees, laying out our gardens and fruit patches and making our summer plans. All the spring signs are making me want to freshen and spruce, to make the house a little better, to use these last weeks of winter to get ready for all the time outside when we will not want to have indoor projects with which to busy ourselves. This itchiness to cleanse, purge, and spruce is a sign of late winter for me, too. I am working on convincing Jonathan that I need to paint the kitchen cabinets. I talked about this last year at this time too, but I never got to it. Never convinced him that this was a wise project to take on. Soon our tag sale wood stove/new sap evaporator will not be my dry straw storage area in the barn anymore, and will be carried outside for maple syrup season. And I will not have time to paint. Besides the sprucing, mostly painting, that I would like to do myself, our minds have turned to some of the caretaking that we hope to do in the warmer months of summer. I warn you. There can be things about old houses that are anything but beautiful. There is some unsightly going on here. But I thought I would show you a few of these things. The dark underbelly, so to speak, of this otherwise incredible home. There are a number of projects we would like to work on outside. The first and probably most important one is the chicken coop. This has been a hard winter on the chickens. We would like to either modify or change their housing for next winter. With the intense cold and deep snow, they have seemed too confined this year. And our flock has sadly dwindled. And given that their coop is freestanding and not well insulated, we have had to rely on a heat light to keep them warm enough on the coldest of days. We are thinking of either expanding and insulating their space here, or finding a place in the barn or perhaps building a different structure for them elsewhere. We would like to rely less on the heat light and more on an improved shelter. Because my electricity bill does not like heat lights. And make some storage for supplies as a part of it. Because the hauling of supplies across the tundra during the polar vortex is wearing on me. And my arms. Another outside project is the repair of the stairs to the river. They are desperately in need of leveling and support, having been bent and buckled and snapped by the intense frost heaves that form on the bank when the draining melt freezes fast and hard over and over again. And, we hope to build a more permanent wood lot structure, one that does not involve the wind catching, rain permeable, frozen to the ground, and therefore human impenetrable tarp. At least this year we seem to have ordered and stacked enough wood. Even with maple syrup season still ahead of us. And while we are at it, the garden shed is slowly rotting away. There is a hole in the floor that is widening, and my piece of wood with a brick on top if it is no longer sufficient. I am thinking that the roof may have a lot to do with this. As I walk around thinking about these projects, I realize just how much of how we live here, and how it is different from how we have lived elsewhere, is inspired by the story of this home. By its history, its land, its outbuildings and landscape. The exterior of the house needs most definitely to be painted. While we line up a small amount of funds to begin this work, through refinancing and saving, we are getting excited about making this old house a bit more modern. We would like to update our heating system. What's your envelope? we were asked by a consultant. Given that we didn't know what this means, we know we have a lot to learn. R values and such. But, a bit of research is helping us to learn. It starts with windows. Our windows are gorgeous and original. But in need of repair. Some are broken. And most do not readily open. Which makes for some hot and stuffy summers, and some cold and drafty winters. And also? Our attic should probably be insulated, right? ...it is again no question of expediency or feeling whether we shall preserve the buildings of past times or not. We have no right whatever to touch them. They are not ours. They belong partly to those who built them, and partly to all the generations of mankind who are to follow us. And perhaps I should not be able to see outside quite so easily through the vents and window surrounds. I think our envelope may have a tear or two. Currently, we heat the house primarily with two wood stoves. Whatever is goode in its kinde ought to be preserv'd in respect for antiquity, as well as our present advantage, for destruction can be profitable to none but such as live by it. These, plus the heat set on the lowest possible setting to keep the pipes from freezing, especially when we are away, keep us warm enough, but not as warm as I would like to be, particularly in rooms farther way from the wood stoves. Unfortunately, it just isn't feasible to tend all eight fireplaces. Though I often marvel at what life must have been like centered around each of them, tending each and every one as a regular part of the day. And now, I take you to the most terrifying of places. The basement. Basements of old homes. They hold the home's truths we were told by a historic home preservationist who visited us here. Never have I seen someone so eager to explore a basement. But those basements? They can also can be quite scary. In fact, our friend refers to ours as the Blair Witch Project basement. They definitely hold rodents, and maybe? Ghosts. Even if they do have knowledge of this home's story. I don't like to conduct my interviews with unexplained noises and shifts in light and movement, in the basement. But, given how cold it is in the house, and how we sometimes still have to fill the oil tank in the summer just for hot water, we would like to get the hot water off the oil furnace system because summer oil seems silly. Memory is reality. It is better to recycle what exists, to avoid mortgaging a workable past to a non-existent future, and to think small. In the life of cities, only conservation is sanity. Seriously, the basement is a bad place. And I can't imagine that this system I devised beneath the kitchen one morning is the best way to keep the water pipes from freezing. So, we are thinking about solar power. We have this perfectly oriented roof on the barn. Newly shingled and all. There is something snappy to me about the idea of solar panels on the roof of a 250 year old barn. Old ideas can sometimes use new buildings. New ideas must use old buildings. While walking around this week, I accidentally found another necessary project. And, the unexpected should be expected here in an old home. The problem started here, we think. A build up of snow and perhaps an ice dam. I came upon, noticed, as I was dreaming of fresh paint, this. We have a problem. Just upstairs, I noticed this, in the wall. Great architecture has only two natural enemies: water and stupid men. I am trying not to think too much about how this soft area in the wall is where I have also heard some late night scratching in the wall. Because I think this hole is getting bigger. Well, that's what the experts are for, right? Good thing we had them lined up to come. Because I don't think paint, or even duct tape, is going to fix this one. Our home. Sometimes it's not all pretty. And it is a lot of work. And it's not even mud season yet. American culture, and advertising in particular, has done an excellent job of convincing consumers that they are the center of the universe, and that their needs and desires should be more important than anything else. This has led to a huge sense of entitlement, including the idea that one's time is so valuable that it couldn't possibly be spent maintaining the house. Here's some news you may find distressing. You are not the center of the universe. I am not the center of the universe, either. We are temporary. We are not playing Monopoly, and there is no "get-out-of-maintenance-free" card. (Those who are elderly or disabled get slack.) A house comes with responsibilities, and a historic house comes with more responsibilities. We are only the caretakers of these houses, which were here before we owned them and which will be here after we are gone. They contain the wood from the old-growth forests, they are monuments to the skill of those who labored to build them, they represent our cultural heritage. To destroy them, or allow them to be destroyed by neglect, to remove their original fabric in the pointless pursuit of "no maintenance" is profoundly disrespectful both to the trees that gave their lives and to the labor and skill of those who built the houses-with hand tools, I might add. Who knows how many of these things will happen this summer, and what our small budget will allow after the necessary fixes occur. * While I was researching greening historic homes, and envelopes, and r values and such, I came across the National Conference of State Historic Preservation Officers website. The quotes in this post are taken from that site. The NCSHPO is the professional association of the State government officials who carry out the national historic preservation program pursuant to the National Historic Preservation Act of 1966, as amended (16 USC 470). Strangely, I find that act a fascinating read. There is a small ski mountain that we have visited a few times now in the past years, since we discovered it. It is far away. Maine far away. As in one of those Maine places that is farther from us here in Portland than places three states away. It is up in The County (Aroostook, for those of you from away), and it takes 5 hours for us to get there. It is in the town in which my father grew up, where I visited my grandparents as a child, and where we still have a family camp, built by my father and his father. We go there often in the summer. But winter? It just doesn't make sense, really. What I remember from the winters of my childhood in this town, when we visited my grandparents year-round home, is the snow. My grandfather and father were in the electric utility business, and so, given what their eyes were drawn to, one of the things I noticed was the height of the telephone poles, the wires strung between them held quite obviously further from the ground than they were down south. To keep them above the height of the snowbanks, my parents explained. Similarly, mailboxes there had disproportionately long necks. Of course, you only really noticed this in the summer. The other thing I remember was the fun that the mammoth amount of snow up there could bring to kids. My brother and I used to have epic snowball fights, the one lucky enough to have the small milk delivery door in my grandparents' garage within our own bounds having an obvious slammable advantage. 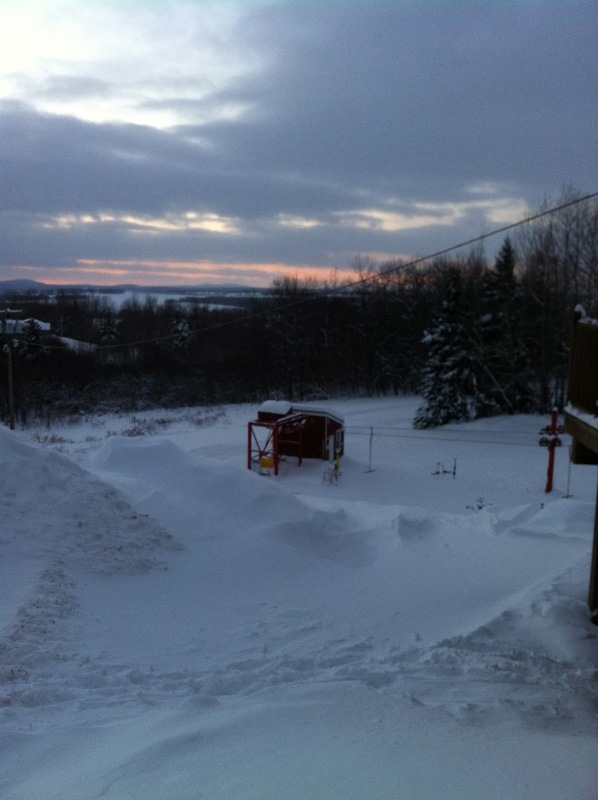 Last year, with less snow down where we live, we headed north to Presque Isle during school break, to ski in that snow, both nordic skiing at the Nordic Heritage Center, and once there and discovered, alpine skiing at Quoggy Jo. Returning this year, as we drove, the kids asked again and again in the car, how much longer? How many more hours? How high do the mile markers on the Maine Turnpike go (because up there, it's just you, the moose, and the mile markers for hours). There are signs that warn you to watch for eagles in the road. And patches of birches bent to the ground from the ice storms. And snow banks. Hundreds of miles of snow banks. I resisted the temptation to answer with a didactic, it used to take my family 8 hours to get there before the 75 mph speed limit. 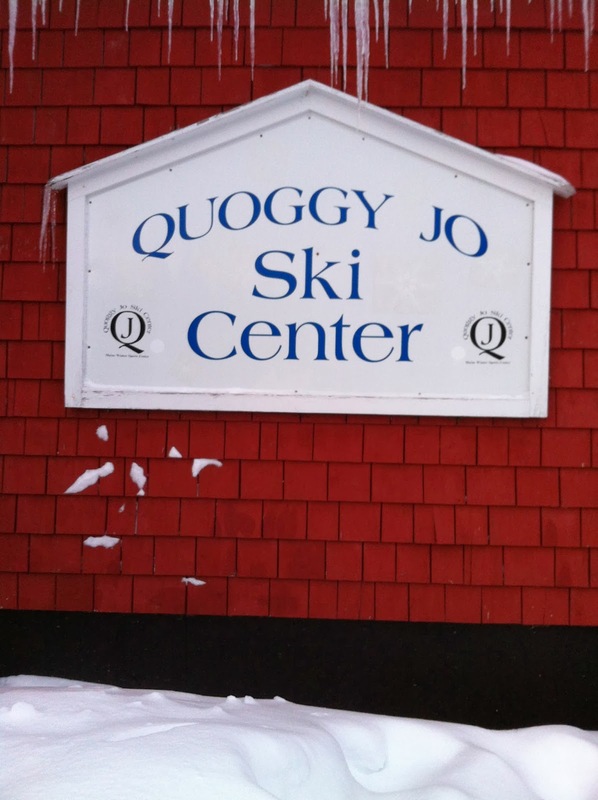 Quoggy Jo Ski Center is a simple but well maintained place with a small town feel. It holds a special place in my heart, and for my family. It is family oriented, intended for novice and intermediate skiers, and feels friendly, comfortable, safe, and therefore allows the kids to feel a good deal of freedom while there. Thank goodness it has received support from Maine Winter Sports Center, because a place like this should not go under in the way that so many small mountain centers have quietly disappeared, much like the drive in movie places of summer. This mountain. Or, is it a hill? Is this a small mountain or a large hill? Elliott asked me these kinds of questions as we rode up the incline together, however you choose to describe it, over and over. I realized. There is something about coming to a place that stays largely the same, occasionally but consistently. It makes you realize just how much has changed since you were there last. As I watched everyone get into their gear, I realized how different, how much more independent they had become from last year. And how much each of them had grown in height. Our stop on the way north at LL Bean for replacements for snow pants that had become too short and too threadbare on the knees had also made this apparent. There will never be another year in which Elliott is sporting a toothless grin. Or when he is half as tall as Jonathan. The thing my children talk about most about Quoggy Jo, when we are not actually at Quoggy Jo, is the T-bar. It is our nemesis. It is also strangely beautiful. As is the case with many a nemesis. Jonathan and I in particular have struggled with it. Last year, all of us wiped out when trying to get on it, but Jonathan and I most dramatically. Lurching forward, tipping our already precarious balance, skis going in opposite directions and also behaving as though they are left behind while your upper body jolts forward. And then, the total flop, the often painful flop, in which we have somehow ended up in a knot. And yes, it is embarrassing to say that there was usually a small child underneath our heap of chaos. Screaming. Because our large adult bodies are heavy. It gets each of us a bit nervous as we drive north, thinking about trying to mount that bucking bronco the next day. Last year, we worked out a system, after a good deal of public flailing, which unfortunately, given alpine ski equipment, is only worsened by what happens after the flailing, when one lies prone in a tangle of skis and poles and a small screaming child and boots that do not yield and feet that are so heavy that it feels like they are encased in buckets of concrete while upside down T's pass rhythmically past your head...all of this happening within approximately five feet of an audience, those skiers waiting in line for their turn to gracefully ride their way up. By the end of the day last year, we had it figured out. Nicholas rode alone. Jonathan rode with Elliott between his legs on one side of a T. And Julia and I shared a T.
And this is how we did it this year too, on our first visit there over Martin Luther King Day weekend a month ago. Julia and I? We were anxious T bar riders. We processed all the way up the mountain how our entrance to the T bar had gone, how we might have done better. How something had almost gone wrong, but we had made it. And about half way up the mountain, our discussion would turn to planning. For how we were going to get off the T. How we were going to exit. Without ending up in a heap. We were like little old ladies discussing our wild rides on our motorized scooter Larks. We analyzed the signs like they held secret truths. I laughed at us when, in the car ride after skiing that day, Jonathan told me about the funny story that he and Elliott had made up while riding up the hill. Something to do with what it would be like to put our cats, dogs, chickens and honeybees on skis. They were giggling and being goofy. This was not how Julia and I were spending our time. And so, it probably is for the best that this time, Julia ditched me. It only took one ride, in which she detailed for me everything that I had done wrong and had almost made her fall, and that I should really think about getting some more fashionable ski clothing, after which she informed me that she was going to ride the T with Nicholas today. And I think that was good, because I wasn't sure how much more my weak ego could take. And also, having looked at these pictures? She's right about the parka. And the pants. Julia and Nicholas asked if they could ski alone. I swallowed. Looked at the bump/mountain and the lovely families there with us, and the awesome teenaged ski staff. And said yes. It was really very moving to watch the two of them figure out this process together. To begin to chat with the very cool teenager who was loading the T. And to watch them ride up the mountain together, laughing and chatting, each of them helping the other out with loose goggles, mittens, and bindings. Much more evenly matched in height than Julia and I, and yet Nicholas clearly stepping into a bigger sibling role that I don't always see from him. Which I think is good, he is definitely not always in charge, his say does not overrule the others, and Elliott and Julia are just as likely to have the strongest voice in a discussion as he is. But it is nice to see him rise to the occasion when it is appropriate. The benefit of Julia's unfriending me was that I moved down the line in ski buddies. I got to ride with Elliott. And Elliott had the opportunity to learn how to ride the T like a big kid. Alone, on his own side. There was a bit of a height mismatch. And my muscles are still screaming at me about the contorted position I needed to assume in order to make riding side by side with that toothless three foot skiing dynamo work. And so, with this shift in riding and hence in ski pairings, all of us a bit more skilled than last time, all of us able to at least try all of the trails on this small mountain, we had a day of togetherness that was so very wonderful. And we really did do all of the trails. And then, running out of options, the kids began their backwoods skiing. Following little paths, single sets of tracks off the groomed trails heading into the woods, where other kids had built jumps and moguls and quick turns and several series of steep mounds that you had to bounce up and down on while in a crouch in order to fit under tree branches. It was so much fun for them. Jonathan and I -- after we had gamely followed them into the trees where he face planted and I actually wrapped myself around a tree when one foot went on one side and the other disobediently went the other, a branch to my gut -- stayed on the wider groomed trails, able to catch glimpses of them as they sailed along next to us. We could hear them giggling the whole time. And without being told, they never left each other behind. I could hear them calling to each other and checking in if someone was out of view for a few moments too long, taking off their skis and walking back to help someone who was in a tangle. And then, whoosh, they would all three fly out of the woods and down the hill again, collecting at the bottom in order to do it all again. 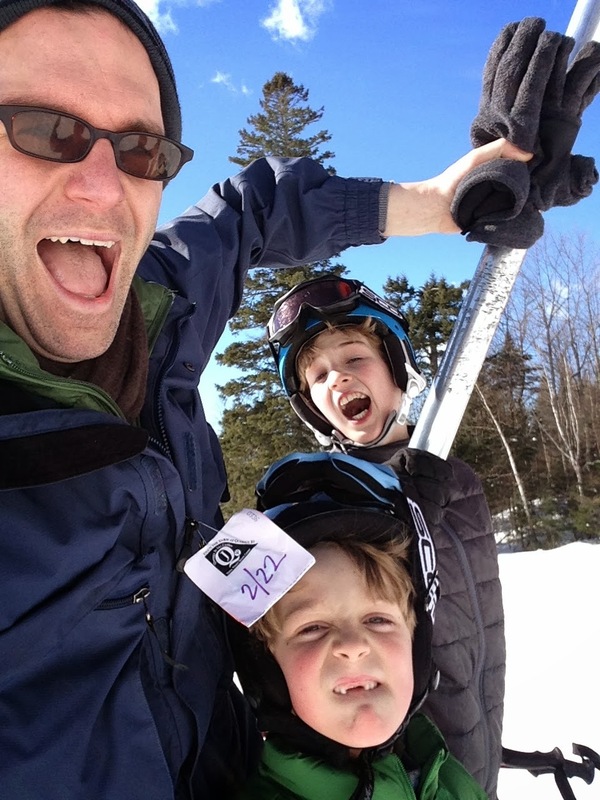 Nicholas was floored by Elliott's fearlessness and balance on his skis. And he knew to tell Elliott this, and the grin that Elliott gave him back? Well worth every penny of the $8.00 ski passes. And, honestly, worth the five hour trip, the aching muscles, and the testing of roles and boundaries. And patience. But the real highlight? Eating the mountain's culinary delight. The gourmet walking taco. That would be a taco. In a Doritos bag. Speared with a plastic fork. When eaten during a day of skiing, sitting on a porch in the warmish sunshine, looking out over snow covered potato fields? It is the most delicious thing you have ever tasted. Toward the end of the day, I was even allowed another ride with Julia. This time she told me about the awesome air she had taken on a jump. And how Nicholas was really fun to ride with. And of course, the boys took selfies when they all rode together. And we all realized. All the measuring, comparing, adjusting, boundary testing and equalizing. All of that. That is what makes the drive worth it. For an occasional but consistent reevaluation, sizing up, seeing where we are, and realizing that it will only be like this momentarily. It will only work like this, be like this, for now. And, therefore, throw yourself into it, be in it while it lasts. Because next time, we are likely to do this -- will have to do this -- differently. All this during a day on the sweetest little mountain in Maine. 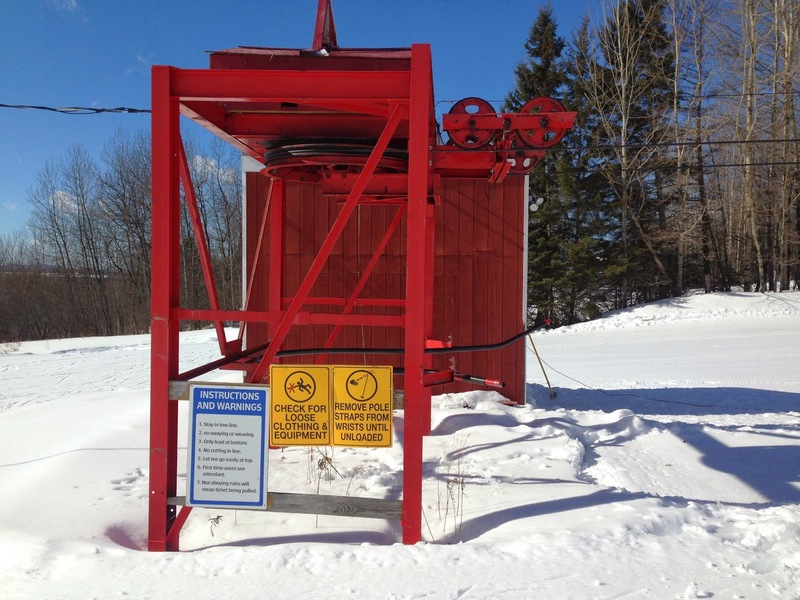 * Note: The Maine Winter Sports Center -- the backbone of many skiing venues throughout Maine -- has recently lost its primary funding and is seeking new sources of financial support. If you can, they would benefit enormously from any support you can provide whether financially and/or by spreading the word about their programming and capital campaign.